Vietnamese food may not be as popular as other Asian cuisines like Chinese and Japanese, but it is slowly getting the worldwide recognition. One of the reasons why people are eating Vietnamese food is because of its healthy dishes. The people of Vietnam love chomping on healthy food like fresh vegetables, rice, noodles, and herbs. In the past, Vietnamese cuisine was only known for two dishes—bread rolls and spring rolls. Yet more and more people are getting acquainted with the many tasty treats that the Southeast Asian nation has to offer. Vietnamese cuisine is also influenced by other cultures, like the French which used to control the country. Nearby countries like China, Thailand, Laos, and Cambodia have also influenced the way Vietnamese prepare their food. Common ingredients of Vietnamese food are soy sauce, fish sauce, shrimp paste, fresh herbs, vegetables, and fruits. The Vietnamese are also fond of using other ingredients like ginger, lemongrass, mint, lime, Saigon cinnamon, and basil leaves in their dishes. 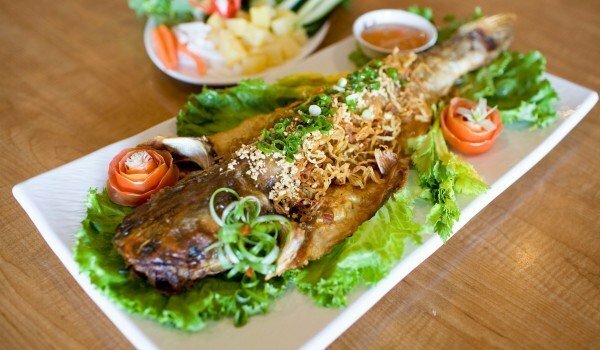 Vietnamese food may not be widely commercialized in the United States but Asian specialty restaurants like Genghis Grille and even seafood dishes like Bonefish Grill have servings of Vietnamese dishes. Here is a listing of some of the best Vietnamese food you should try soon. Phở is a noodle soup widely considered by the Vietnamese as their national dish, albeit unofficially. The noodle soup comes with beef or chicken. The Vietnamese say that Phở has its medicinal qualities. In fact they recommend this dish for people who feel that they’ll have a cold anytime soon. It is usually served for breakfast, but it can also be eaten for dinner, lunch and even for snacks. This is a simple dish of morning glory consists of green leaves, fish sauce and garlic. This is stir-fried and served with slithers of garlic. While the dish is popularly served at Vietnamese beer gardens, many Vietnamese restaurants have also included it in their menus. This is a bite-sized spring roll that is crunchy and well-loved in Vietnam. The people of northern Vietnam call it Nem Ran, while in the southern part of the country it is called Cha Gio. Inside it is a soft vegetable and meat filling coupled with a tangy sauce. It is often served as an appetizer. For the Vietnamese, the Cháo is the ultimate comfort food. This rice porridge may not have the most appealing of names, but it is versatile as it comes in numerous versions like chicken, fish, pork and vegetable. It is creamy and a little salty. It is garnished with lots of ground black pepper and chopped onions. This is a cold pork noodle salad that combines fresh rice noodles, marinated pork barbeque, fresh herbs, shredded lettuce, spring onions, peanuts and bean sprouts into one tasty mix. This cold noodle dish originated as a street food in Vietnam before making its way into restaurants. Here’s one example of the French influence in Vietnamese cuisine. Bánh mì thịt is a tasty snack that takes its cue from the French baguette. However the Vietnamese reinvented the dish by adding local sausages, pork, vegetables, cucumber, mayonnaise, chili, pepper, and soy sauce to make it more tasty and intriguing. This is a pork and prawn salad made up of vegetables like green papaya, banana flower, shredded carrots, fresh herbs and onion. To eat, simply load the prawn cracker on the salad and enjoy its tasty flavors. This is barbecued prawns with chili. This is a couple’s dish in Vietnam. Guys are supposed to peel the prawns for the ladies. The chili and salt marinade usually gets stuck to the prawn’s shell, but there’s a lot of flavor to enjoy once you have peeled off the prawn and slid it off the skewer. Vietnamese food is not all about noodles and spring rolls. Try this chicken marinated in honey and grilled over large barbecues. When you eat the chicken, you’ll notice that the chicken legs and feet are tender while the skin remains crispy. Think of it as the local version of KFC’s famed chicken meals. This is a creamy soft egg white foam that is placed on Vietnamese coffee. It is a drink, but is often listed in the dessert section of a Vietnamese restaurant menu. Even if you don’t like coffee, it’s almost a sure thing that you’ll get fond of this dessert. These are some of the more delicious Vietnamese dishes that you should try out soon. If you happen to be dining at a Vietnamese restaurant, don’t hesitate to be adventurous and try out their local specialties.